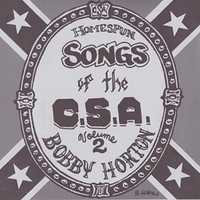 Due to requests from customers and dealers for a volume two of "Songs of the C.S.A." I decided to record more of the great Southern war tunes I had researched. Like Volume one, it was my desire to present these songs as they would have been performed during the 1860’s by the common folks – to present tunes in the style of string bands, military bands, and parlor tunes. I also include a tune written in the 1960’s by a songwriter named Don Oja-Dunaway who had just read Sam Watkins’ great reminiscence called "Co. Aytch". I recorded these tunes in my home studio (on a Fostex 8-channel analog recorder), played all the instruments, sang all the vocal parts, drew the cover art, and the liner notes were hand written – hence the name "Homespun" in the title.